My eating habit these days has been worse than usual and not eaten real food but only snacks. Last night, around midnight, I started getting seriously hungry and my husband said I should get a pizza. 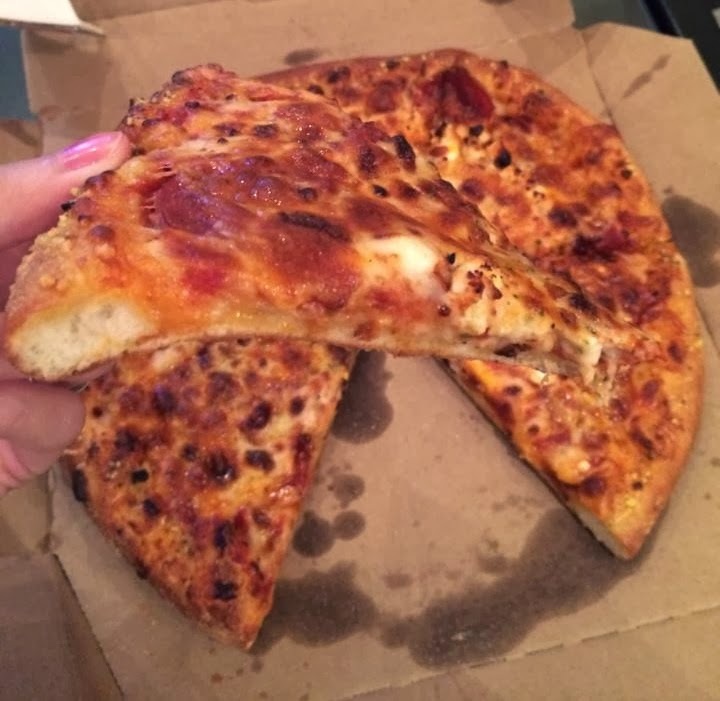 However, I had hard time using US Domino's site, so my husband in Montreal ordered a pizza online via US Domino's site and set it to deliver to the apartment in NYC, where I stay. My order details are the following. 6 kinds of cheese are; made with 100% real mozzarella, feta, provolone, cheddar, Parmesan and Asiago cheeses, sprinkled with oregano on a cheesy Parmesan Asiago crust. The reason I got this pizza is because it's got a name "Wisconsin." When I studied in Wisconsin, I became more cheese lover including mac'n'cheese (Kraft is the best). In the supermarket, various kinds of cheese were found in a big section provided solely for cheese. The name was outstanding and attractive, and also I remembered how I miss Wisconsin cheese, thus I instantly knew which pizza I wanted. 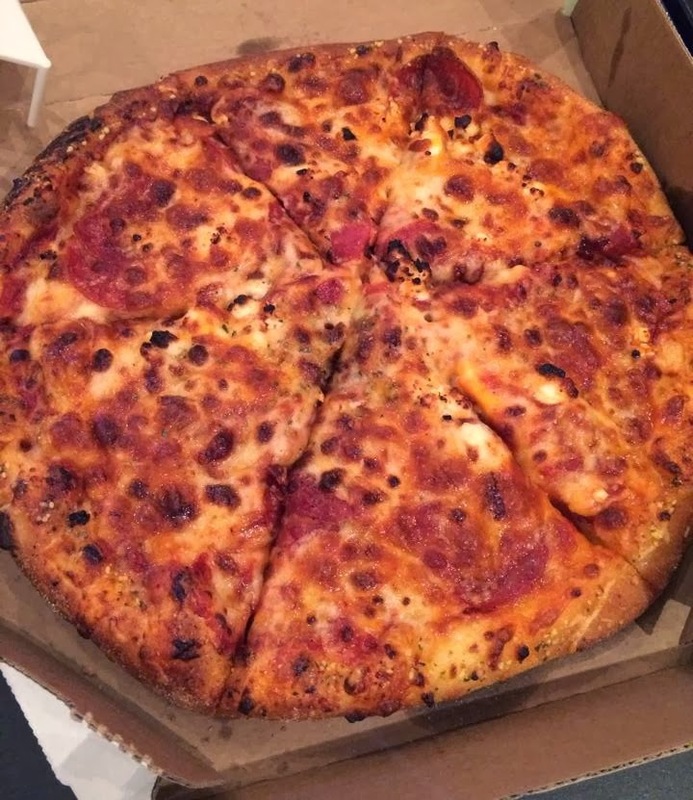 The pizza was delivered around 0:45AM. 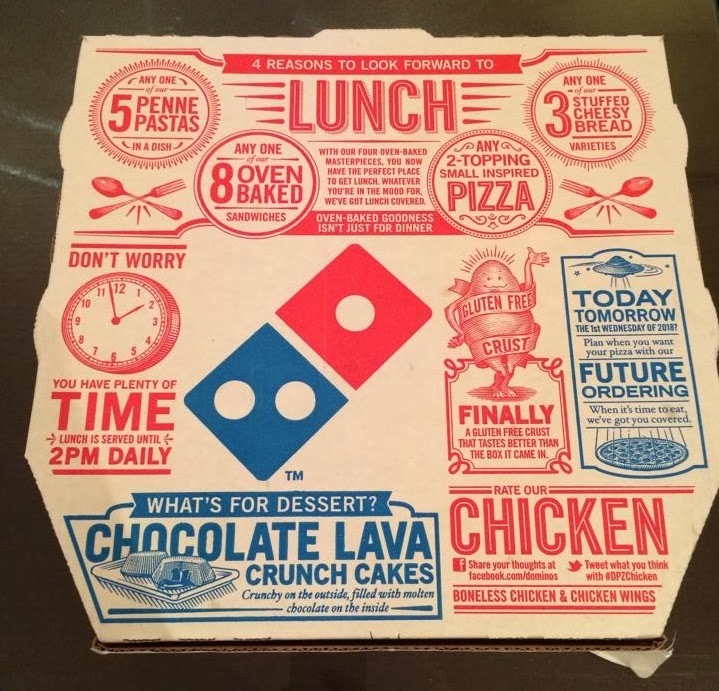 The 6 cheese, I couldn't tell all the different favors but it's definitely richer, deeper and more flavorful than regular domino's pizza. If I had ordered as it is, without pepperoni, I might have been able to taste the delicate differences of the cheese they put. The tomato sauce had basil and maybe also oregano on the crust, which were a bit bitter but the flavor wasn't disturbing at all. The hand tossed crust is garlic-seasoned with rich buttery taste. The texture is soft and what I like the most about the this type of crust is that the garlic. It's just so good and go well with any kind of pizza. Oregano sprinkled on the crust was a little bit too strong for me. But in any case, to eat something I was craving for in the middle of the night made the pizza more delicious indeed. By the way, in the order confirmation e-mail, they remind a tip. "Any Delivery Charge is not a tip paid to your driver. Please reward your driver for awesomeness. Our drivers carry less than $20." It's nice to know that they mention the conditions.